The first month of 2015 comes to a close with another great round of guests on the Social Pros Podcast. In January, we heard from JetBlue’s social media customer support leader; the social media manager of outdoor-gear retail chain Cabela’s; and the LinkedInExpert herself. As always, these Social Pros bring different perspectives, strengths, and backgrounds to the table when they join us to talk about social media as a tool to share information, support the customer experience, or strengthen your brand. To start the year off right, this month’s guests all echo the importance of humanity and passion shining through in social media. Cabela’s has been an outdoor retail chain since the 90s, growing their stores and rolling with the dot-com craze. Adam Buchanan assists the brand in growing their digital presence through social media. 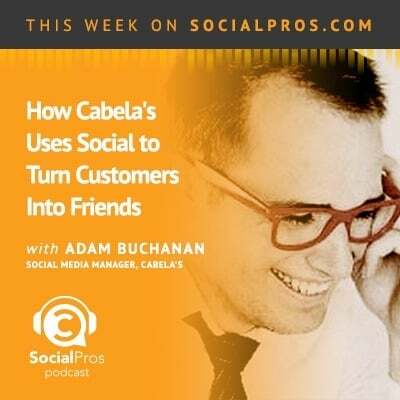 One of the best ways Adam and his team share top-notch content with the Cabela’s audience on social media is through the passion of customers. The most successful campaigns they’ve launched revolve around customers’ love for the outdoors, whether it’s parents taking their children camping for the first time, or experienced fishers showing off their latest catch. One of the best examples of how Cabela’s is harnessing its customers’ enthusiasm is their It’s In Your Nature campaign. Hey, these are real people. We’re real people. We sell fun. Content isn’t just coming from customers; it’s coming from outfitters (employees) and authenticity experts (a team of volunteers who are recruited by Cabela’s to combine their expertise in the outdoor arena—camping, fishing, hunting, etc.—with their passion for social media.) The Secret Outfitter campaign is a great example of employees on all levels (from the CEO all the way down) getting fired up about Cabela’s. And when content is created internally, Adam and his team center messaging around Cabela’s values, keeping a very human and personal feel to everything they do. 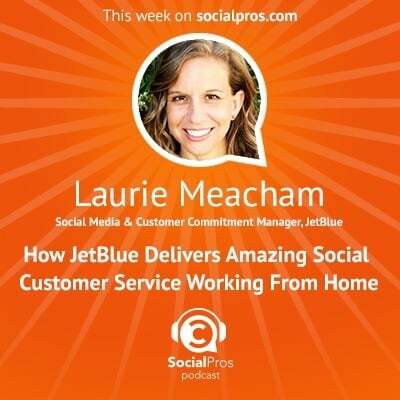 Laurie Meacham oversees a team of 90 crew members on the Customer Commitment team for JetBlue Airways. One of the things she looks for when hiring new crew members is passion for JetBlue. As the frontline team dealing with customer issues and complaints, it’s important to the find folks who believe in the brand and are constantly curious to learn more and keep a finger on the pulse of what’s going on. Pair that trait with customer service skills and training, and you’ve got a dynamite team committed to keeping customers happy. Laurie’s team all work from home (as does Laurie). This can be a challenge, as no amount of electronic communication can take the place of face-to-face interaction. To keep that human spark alive, they make it a point to meet in person once per quarter. At those meetings, guests are brought in from other departments at JetBlue, making it possible to put a face to a name that may have come across in emails. It helps everyone who is working remotely to feel connected. Our crew members know our customers. There are definitely relationships being built there. Another way JetBlue keeps their voice human on social media is by using their customer commitment team as the “canaries in the coal mine” for various marketing and brand initiatives. As the frontline folks, they can better anticipate how customers will react to new campaigns. What better way to stay connected to customers needs than by talking to the people who interact with them every day? 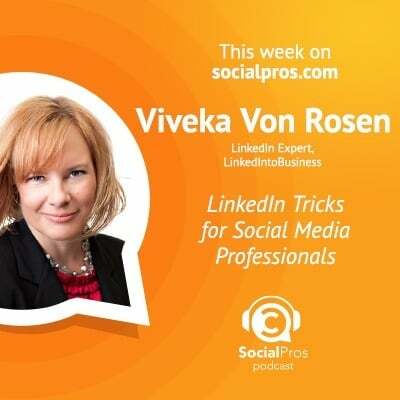 Viveka von Rosen is known around the world as the LinkedIn Expert. She’s written the book on LinkedIn and her consulting company, Linked Into Business, keeps her busy keeping track of the changes and trends on LinkedIn so she can share her insights with her clients. Viveka says you’re going to have to give extra effort if you want the results (on LinkedIn, but also other social media platforms). It takes added effort to find and truly connect with people on LinkedIn who will resonate with your content and your brand. It takes more than copying/pasting content from your website to LinkedIn to truly resonate with the varied audience you’ll find there. Automation is helpful (even necessary) in the digital world, but it’s never going to replace the human element that shines through social media. Keep your personality and keep yourself intact in social media. Viveka’s one tip for being a social pro is to “keep your personality in your interaction, whether it be on LinkedIn, Twitter, Facebook, Pinterest, Instagram, whatever. Be human. Be recognizable. Allow your voice, your face, your interactions to be recognizable just by the way you say hello.” Whether it’s your personal or company brand, whether on LinkedIn or any other social platform, you can be professional while still keeping a personal voice.